Meg was at camp this morning. The reds were playing with each other upstairs. Next thing I know they are having a screaming match over a very dumb valuable toy. I tried out some of my refereeing skills before I had to get ready to leave the house for an errand. I tried to get them to forget about it but that didn't work. So I made them both stay in their rooms until I had mentally prepared myself for the difficult task ahead. While I was in the bathroom Kade came in and asked how to spell room. I knew this was not leading to a loving act. 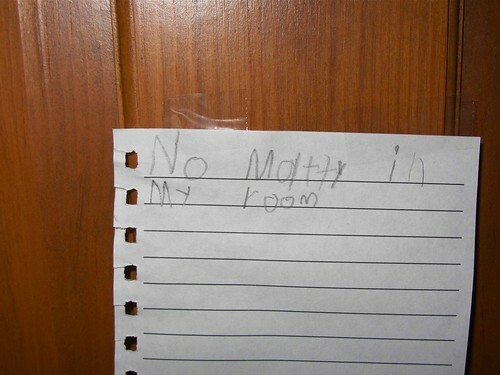 I asked him why he was making a sign for his door. He was shocked that I knew what he was doing. I told him that I wasn't going to spell the word for him. If he couldn't sound it out then he didn't need to put the sign up. Well, he sounded the word out and this is his sign. He forgot Mattey's e. Oops. Mat saw his handy work and she set out to make her own signs. They were equally loving. Somehow while we were out running our errand the reds managed to solve their own problem and reached a compromise. I was so happy. I've been waiting for the day this would happen. The cease fire only last a few hours before I heard more yelling. Only two more weeks to go. I think I can make it. In other news...Megan has put herself on the DL again. She tripped over her own shoe at camp and landed on her right hand wrong. I think it's sprained. (My medical degree comes in real handy sometimes.) So she's icing and wrapping it. Tomorrow's the last day of camp. She'll really learn to handle the ball with her left hand now. The coach told her today that she'll be the only 7th grader playing on the varsity team with the 8th graders. Wow.